James Brown, who was homeless for more than 20 years in Los Angeles, in his apartment building in East Hollywood. James Brown's modest, walk-up apartment costs $1,300 a month. He pays for it partly with Social Security and the rest is subsidized by the federal government. Today, Brown still lives in the same apartment — a success story in the struggle against chronic homelessness. And while the homeless rate in the U.S. has been going down overall, it's growing in LA as well as some of the nation's other costliest cities. By the latest count, there are almost 58,000 homeless people in Los Angeles County, a 23 percent increase from last year. Brown is charming with a quirky sense of humor. When he started to give a reporter a tour of his East Hollywood apartment five years ago, he stopped when he saw the microphone. "OK, wait a minute, since this is radio, no one can actually see what's going on," he observed with a smile. "And they can only go by what they're hearing. All right." He described his small, somewhat drab, one-bedroom apartment as splendid and spacious, with what he said was a spectacular view of what looked like a quaint Swiss village on the horizon. What could actually be seen outside the window was mostly the brick wall of the building next door. But for Brown, the apartment was splendid. He had spent more than 20 years sleeping on pieces of cardboard in the back alleys and doorways of LA-area businesses. He was so grateful when he finally got housed in this apartment that he sent handwritten thank you notes to those businesses for letting him sleep on their property when times were tough. 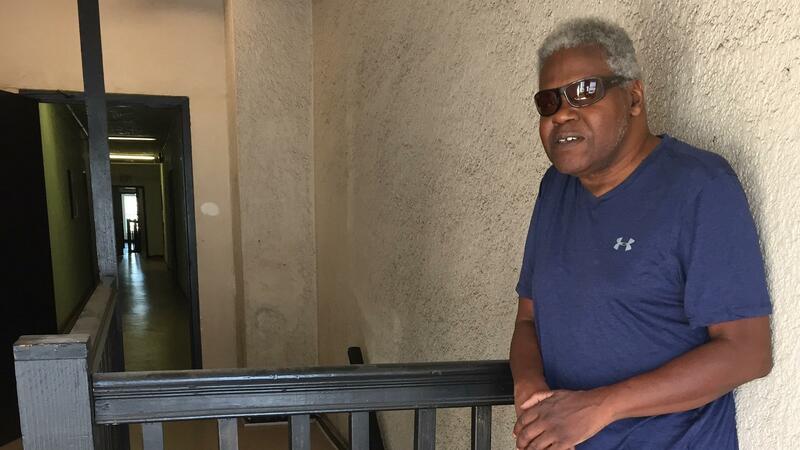 Now 60, Brown is a little thinner and more frail than when he moved in, but he easily walks up the four flights of stairs to his apartment. "Well, you know, I found that it wasn't an easy transition, believe it or not," Brown says, as he settles himself onto the speckled gray and pink linoleum floor in the hallway outside the apartment because the interior s being fumigated for bedbugs. Brown says it's great having his own place, where he can shower, watch TV or get something from the refrigerator whenever he wants. He enjoys the privacy and not being on public view all the time, as he was living outside. But he also says it has been hard at times, doing things as simple as keeping the bathroom clean. 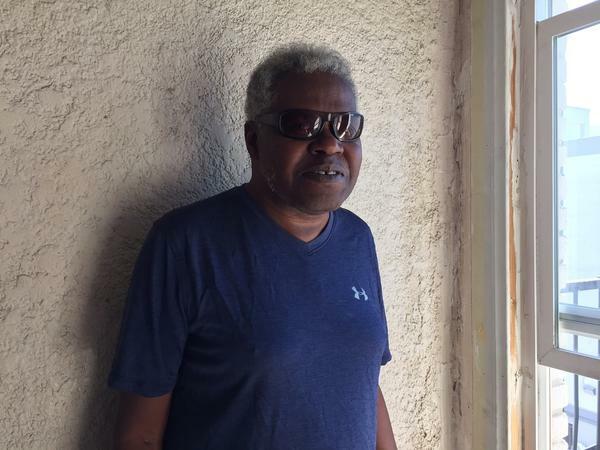 Brown has also had problems figuring out how to make new friends, and he still takes the bus downtown to Skid Row to visit the ones he made years ago living on the street. "It's just the old gang. What can I say?" Brown says. "We went through a lot of experiences together. We were homeless together. We slept in the same alcove together." Brown says what's most disappointing to him since he got his own apartment is knowing that so many still live outside. "We feel like an assembly line that's getting faster," says Rudy Salinas, who's with Housing Works, a nonprofit agency that helps Brown and hundreds of other homeless and formerly homeless individuals in the area. Salinas says there are not only more homeless people in LA, but those his group is seeing are increasingly old and in poor health. "This is an aging population that has been allowed for decades to stay on the streets," says Salinas. "By the time they engage us and they start working with us, the crisis or the thing that we have to focus on most quickly, right away, is not getting their income turned on or finding a landlord, but it's stabilizing them in a medical home." He says some of their clients are so ill, they could easily die before getting settled in permanent housing. Salinas says it's also getting more difficult to find affordable places to live in Los Angeles, as in a number of cities. Brown's extremely modest, fourth-floor walk-up apartment costs $1,300 a month. Brown covers part of the rent with the Social Security benefits he receives for mental and physical disabilities. The rest is subsidized by the federal government. Salinas estimates that it costs his group another $6,000 to $8,000 a year to provide medical and other support services for Brown, but he says that's still a good deal for taxpayers. "Folks don't often consider that a person like James, if allowed to stay on the streets long enough, becomes incredibly expensive, to law enforcement, to emergency medical services," he says. Brown says he was homeless for much of his adult life because he never got his footing after serving three years in the military. He says he could never hold a job and wandered around California, ending up in LA. Now he and others in the city are waiting to see what happens with the $1.2 billion Los Angeles voters agreed last November to spend on new housing for the homeless. The plan is already running into some local opposition. "Everybody's working like hell to end homeless and yet, somehow, somebody's still out," Brown says. "I just don't know what the answer is."